So much for a first attempt at a fairy tale. Here’s a first cut at a debrief. As one of my loyal readers was quick to point out, I left several mysteries unexplained. I never explained the significance of the flowers or the bag. I never explained the growling creature with glowing eyes. There was no payoff, no pun, no moral, no explanations. What do I, as a writer take away from this exercise? One tip that I’ve been given on several occasions that was driven home in this case was that you should write your story backwards. That is to say, you should figure out how it ends and then write the beginning to support the conclusion. That helps to avoid all the loose ends. I think the story has potential if I rewrote it with that in mind. Another lesson learned: it’s very difficult to write a story from start to finish in five hundred word increments with a daily deadline. I may get the hang of serial fiction on a deadline eventually but I don’t intend to try it again until I get some less ambitious projects under my belt. The reason I have tried it so many times is that I have a schedule crunch. There are only so many hours in a day and I still work a full time day job. Writing takes time. Time is a precious commodity. I am going to keep trying different ideas to find time to write. Eventually, I will retire and have more time to spend writing. I am hoping to get in enough practice between now and then that I can actually find a market for my writing. Whether I sell my work or just continue to develop my skills as a story teller, it is a win – win situation. Developing new skills has been demonstrated to help keep the brain young. Besides that benefit, writing is one of only a few ways that I have ever managed to sustain flow. Flow is addictive. If you don’t know what flow is you can read my post, Let it Flow, from last week or the Wikipedia post about it. You can also watch Mihály Csíkszentmihályi‘s TED talk on the topic. I also wrote a post about How I Find Flow. I hope you experience flow. I hope you find your bliss. Remember, happiness is a choice, not a consequence of wealth or possessions. Life is a journey not a destination. Pay attention to the scenery along the way. At the suggestion of a friend, I watched a TED talk called Mihaly Csikszentmihalyi: Flow, the secret to happiness | TED Talk …. I have read his book, Flow, and so the ideas presented in the talk weren’t new to me. What I was reminded of was the necessity of a high degree of challenge combined with a high degree of skill. As I pondered that it occurred to me that in so many of the cases of flow that I have read about or experienced myself, one of the key factors was a level of familiarity with ones tools that was so intuitive that you don’t consciously think about them. Take writing for instance. I have developed my typing skills to the point where I don’t think about spelling words anymore. I just think the sentences that I intend to write and they appear on the page. It feels almost like magic. Similarly, when I write a program, I build it a piece at a time. I prefer interpreted languages, like Lisp or Python, because I can experiment with them as I think about the problem. The IPython environment is especially good for that kind of development as it records every expression you enter and every response that it returns and labels it with an index number (see the screenshot below). You can also step through the history by using the up-arrow and down-arrow keys. You can edit the expression and then execute it again. Typos are not nearly as frustrating when you don’t have to type in the entire expression again. Notice I refer to the previous output with the _ character. The line that starts with the prompt: In : computes the square of 42 ( _**2) . There are many other useful features of IPython. I am still exploring them. The nice thing about them is that they are optional. You can learn about them a little bit at a time and they don’t get in your way if you don’t know about them. This helps you stay in flow by not distracting you. There are other nifty tools to help you write Python code. I have been using one called Spyder that is a multi-pane Integrated Development Environment similar to Xcode, Eclipse, or Visual Studio, depending on your preference as a programmer. 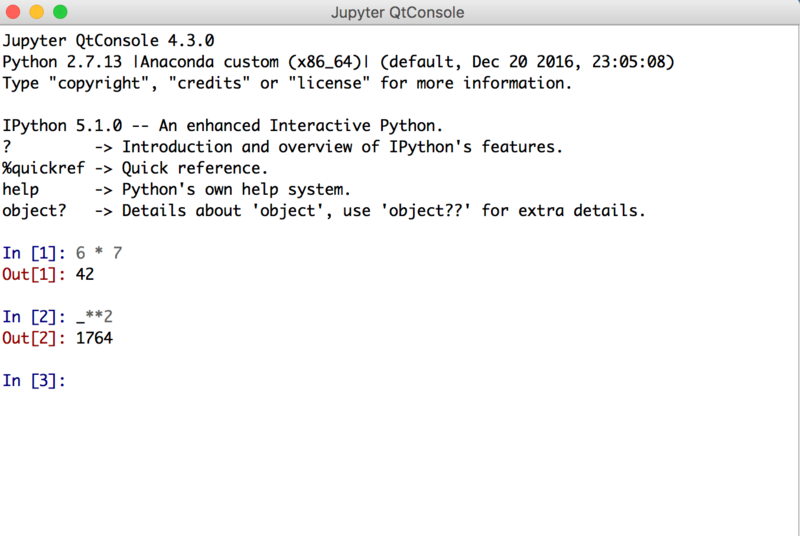 Each of these other IDEs have add on software that helps you develop Python. I’ve wandered a bit away from the topic but the point that I am making is that before you can experience flow while doing a task, you have to be comfortable doing it. Pick a tool, learn it until it disappears. When you are creating, the tool should become invisible to you. Your focus should be on the code that you’re writing, not the tool that you are writing it with. Furthermore, you should be thinking about solving the problem, not how you get the language to do what you want. That takes a good bit of practice to achieve as well. To round out my examples by noting another activity where I experience flow. When I’m playing guitar, I experience flow. Especially when I am trying to play a piece that I’ve never tried before. Or when I try to learn a new song on the mandolin. It challenges me and demands skills that I often have to learn to get into the zone. It’s worth it though. I have a handful of folks that read this blog on a fairly regular basis. I appreciate them. I’d feel a little bit funny if I thought that I was the only one that read what I write. I have been honing my writing skills lately. I’ve set a target length of five hundred words per post. I don’t always write that much. I’m either too tired to think or I’ve said everything that I have to say on the subject. I’ve also made a point to give each post a careful once over to check for malformed sentences and other things that just don’t make sense. The spell checker does a pretty good job of verifying that the words that I use are in fact spelled like an existing word but it can’t tell me whether the words that I use actually mean. I have been intending to write a post to put back for some night when I don’t have time or inspiration to write a post. I understand that editors of publications often do that with feature articles. I haven’t done it yet. There is something motivating about knowing that the deadline is approaching and I have to produce a blog post or else break my streak of how many days in a row I’ve written and posted one. I also keep intending to make a list of potential topics for posts. I haven’t done it yet but I will get around to it eventually. All of these things help make it easier for me to focus on becoming a better writer. That is the goal of this blog. Eventually I hope to write things for publication, short stories, novels, non-fiction articles and books, creative non-fiction, as I learned it is called from a local free lance editor. The more I write, the better I get at it. I’ve started seeking out writers groups online. I joined Scribophile a while back but I am so strapped for time that I haven’t actually participated in the critique activities. They have a procedure where you earn points by reading and critiquing other people’s writing and then you can spend those points to post something of your own to have it critiqued. I also joined a couple of writer’s support groups on Facebook. One is called The 10 Minute Novelist and specializes in collecting suggestion about how to fit writing opportunities into your otherwise already over-full schedule. I need to spend some time participating in that forum as well. The other group that I joined on Facebook is a blogger support group. I hope they can help me improve the quality of this blog and maybe even suggest some ways to find more people that are interested in reading it. I don’t expect to derive any income from this blog, at least no direct income. I don’t think much of selling advertising or reviewing products for hire. I might collect some of my posts into a book form to publish in a different form sometime. I’ll have to write enough posts that are actually worthy of such treatment before I need to worry about that. A friend of mine commented on the post about fiddling with formats that I wrote several days ago. He said that he just used HTML when he wanted to get a page to look the way he wanted. I understand that I always have that option but I view it kind of like I do writing a program. When it comes right down to it, I can always write my programs in machine language. Then I can get the machine to do exactly what I want. Only I can’t really do that any more. The programs that I want to write have become too complicated for me to write them in machine language. It would make a task that I would spend an hour on in a high level language take days. And tasks that I might spend a week on in Python might take months to get right in machine language. Not only is there the issue of sheer effort but there is also the fact that because it takes so long to solve a problem at all in machine language, I would be way less likely to spend the time on tweaking it and refining it than I would if it were written in a higher level language. And finally, there is the heart of the matter. I’m not really looking for the most efficient solution, I’m looking for an adequate solution. I want to think about the problem domain not the intricacies of mapping the problem domain onto the bare metal of the computer. I like my abstractions, thank you. Hence, I use WordPress. I could embed raw html to achieve my layout goals within WordPress. But then I would have to remember how I did it every time and I would, in all likeliness, not achieve the consistence of layout that I am striving for. I’d rather find a consistent solution that someone else has written that is 80% of what I’m looking for than to have to implement it myself. I started writing when I was in high school. I started out writing surrealistic sentences. I typed them on an old manual Royal typewriter. I rarely got more than a sentence or two written before I ripped the page from the platen and loaded another sheet of paper. If it was particularly bad I wadded it up and threw it toward an old school metal waste basket. I had a fantasy that this was how real writers suffered for their art. A year or two later I took a screenwriting class in film school. I got my first taste of what it was like to actually struggle over the details of a story. I wrote about twenty minutes of a feature film before I wrote myself into a corner. Apparently the professor liked what I wrote. I made an A in the course. But I never did work out the problems with the plot. I wrote in fits and starts throughout four years in the Army. Most of the time it was journal entries written by hand in a notebook. I preferred small ones, five inches by seven inches was my favorite. I rarely filled more than a third of the pages in one before I quit writing regularly. Then several months later I would start over with a new notebook. When I finally got my first computer I started writing on it. It didn’t have the same tactile appeal as my notebooks but it was easier to read what I had written. It was also better for the environment. I used way less dead trees. But I was still an occasional writer. Then one day I heard about Julia Cameron’s The Artist’s Way. I read it and started writing seven hundred and fifty words a day. That was seven years ago. I’ve written practically ever day since then. I have noticed that I have been getting progressively better at writing as I accumulated more and more practice. I started participating in National Novel Writing Month (NaNoWriMo) that is held every November. The goal is to write at least fifty thousand words during the thirty days of November. I succeeded twice but the novels that I wrote were not very good. I came to understand that they were first drafts and that I still had work to do to transform them into the stories that I wanted to tell. The next thing that I figured out is that I needed to start publishing my writing. And I had to do it on a regular schedule. Without knowing exactly why, I made a commitment to write a blog post every day. That was last June. Since then, I’ve only missed one day. I also discovered why it was so important. The discipline of writing a cohesive post of a particular size on a strict deadline helped me take my writing to the next level. The latest piece in the puzzle has been to join a Writers Group at my local public library. The group meets twice a month, once to critique each others writing and once for a program featuring a speaker knowledgeable in some aspect of writing or publishing. I am amazed at how valuable these meetings have been to my development as a writer. At this point I’m an amateur writer, I write for the love of writing. Some day I may graduate to publishing works for sale. As long as I continue to grow as a writer, I’m not particularly concerned about that one way or the other. I just want to write things that people enjoy reading. We all tell stories all the time. Sometimes we relate events that have happened to us. Sometimes we repeat things we’ve read or heard in the media or from friends. And even when we make up new stories they are variations on patterns of stories that we have heard. The trick, I suppose, is to be aware of the patterns that you are riffing on and be sure that you make the story your own. I am becoming a fairly competent essayist (opinions to the contrary welcome, especially if you can tell me specifically something I can improve). I would like to become a story teller. What is the difference? I have an idea but it’s kind of fuzzy. This blog is full of essays. An essay is a search for the essence of a topic. My blog posts are not highly polished. I write them off the top of my head. I edit them lightly and then post them. A proper essayist would write the essay. Put it aside. Come back and read it. Edit it. Get friends and colleagues to read it and comment on it. Edit it some more. And then post it. I suppose blogging just exposes the dialectic process more. I write a draft. I post it. Hopefully, people comment. I write more. Eventually, we arrive at something nearer the essence of the topic together. I think this is a good process. Perhaps better than the “proper essayist” process I described before. Back to the point. I want to become a story teller and I am discovering that I don’t understand the process of creating a story. I know a good story when I hear one. I occasionally tell a good story. At least, I think I do. Help me out here. How do you create a story? 7anby made a video that described his writing process. I know, every writer’s process is unique, otherwise much of the magic of the written word would be lost, but there was a spark of recognition as he described how when the muse is at work, the words flow effortlessly. I write to achieve these moments. It is such a joy to see your ideas flow out onto the page and be captured for posterity. Another point of recognition was when he talked about how he needed to write. I feel that way too. I’m not sure that anyone will ever read these words, but I need to write them for my own mental health. I need to write them so that I can become comfortable with the process and start to shape it to my will. I think the mind-page connection has to be firmly established before you can start to successfully shape what goes on to the page. If I think about what I’m writing too much, my censors kick in and I start trying to edit what I’m writing instead of concentrating on getting a draft onto paper. I’ve been told all my life that the most important part of writing is rewriting and perhaps that’s true. But you have to write something first before you can rewrite it. I suspect that is why so many writers keep journals. This gives then the opportunity to become comfortable with the mind-page connection. It’s just like learning to play a musical instrument. You have to noodle around with it for a while until you’re comfortable with the instrument and then you’ve got to practice. And, as the super athletes tell us, you’ve got practice doing it right. If you practice your mistakes, you’ll get really good at making them. I doubt that writing in this journal/blog once a day is sufficient to develop the skills and process that I’m after. But it is better than not writing regularly at all. So I’ll continue writing these short essays and when I skip a day, I’ll get back to the grindstone the next day. I’ve learned that that’s how you get in the habit of doing anything that you want to make an integral part of your life. And I want to make writing, video making and exercising into daily activities in my life. Thanks Mike (7anby) for inspiring me to keep this up until I get it down. I have a friend on You Tube with the screenname 7anby (7 to his friends). I met him on Stickam. On Saturday night Pam and I watch bad science fiction, horror and various other B-movie genre movies that are old enough to be in the public domain on a channel called Sleaze Sinema. If you don’t know about Stickam, it is a video chat site. Our hostess streams the video of the movie on the main screen and we all sit around and make snide comments in the text chat window. Several of us are on camera in the other smaller screens and others aren’t. We laugh and do a really good job of entertaining ourselves. Back to 7anby. I met him on Sleaze Sinema and then I subscribed to his You Tube channel. He writes really evocative short stories and reads them on camera and posts them to his You Tube channel. Lately we have been encouraging him to write a novel. Today I was watching a couple of his videos and he was having the same problem I was talking about yesterday. He sat down to write five pages on his novel and ended up losing part of what he had written to the demented user interface that is called Microsoft Word. So, he makes a wonderful video and tells a great story about his grandfather. This is exactly what I was talking about. He sets out to write five pages and he makes two videos instead. I want to make videos but I can’t seem to come up with ideas for short videos or the time to make them. Note, I mean videos that tell stories, not vlogs. I want to make more vlogs too but that’s a separate issue. I’m just feeling good that I am writing in my blog more regularly and that what I’m writing in my blog is more than just stream of consciousness crap. I’ve got more to say about the Sinema but I’m going to try the technique of leaving things to say for next time so that I can get started easier next time. The problem with so many creative endeavors is getting started. Once you acheive flow (another topic to explore at length in another post) it is hard to find a place to stop. I hate being forced to create in little disjoint snippets of time. I want my flow, dammit.